Lectures in Italy – Аспектум. Aspectum. 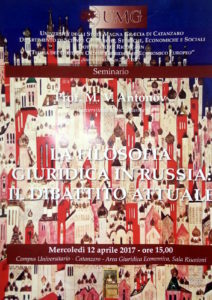 Partner Mikhail Antonov presented a public lecture on “Legal philosophy in Russia: contemporary debates” at the Law Faculty of the University “Magna Graecia” (Italy, Catanzaro) on 12 April 2017.